The Midtown Athletic Club & Balanced Body® Pilates Immersion & Instructor Training program will open your mind to the magic of movement and the joy of teaching. Our curriculum is rooted in classical work with branches that reach into every corner of the Pilates family tree. You’ll learn the work that Joseph Pilates taught plus variations and modifications developed in response to scientific advances and the needs of today’s student for a practice that is safe, effective, and fun. Lizabeth Burrows has been teaching Pilates since 1999. She started studying dance and martial arts at age five. As a high-ranking martial artist, Lizabeth began to teach, and it was then at a young age she realized her passion for sharing her knowledge. She danced professionally from 1998 until 2006 when she decided to teach Pilates full time. Lizabeth received her comprehensive training from Nora St. John and Naomi Leiserson at Turning Point Studios in Walnut Creek, California where she ended up working alongside her mentors. Getting to observe her teachers daily was an opportunity of a lifetime where the learning never ended. This set the course for her future in Pilates. Being a consummate student of movement, Lizabeth continues to elevate her teaching by attending conferences nationwide. As a Balanced Body® Master Trainer, Lizabeth brings an inspiring blend of innovation and precision to her teaching while mentoring the next generation of Pilates teachers. For more information, contact Lizabeth Burrows at lizabeth.burrows@midtown.com. Space is limited. Rather not pay in full? Stop by the club to submit a $500 non-refundable deposit along with your registration. A Service Coordinator will be happy to help. Payment in full is required one week prior to program start date. Balanced Body® Movement Principles is required for Mat, Reformer, Apparatus, Comprehensive Certifications. Pilates Mat work is the foundation of Pilates. The Balanced Body® Mat Instructor program includes the full repertoire of Pilates exercises, along with modifications and variations designed to make you successful with a wide range of clients. The Pilates Reformer is an extraordinarily flexible piece of exercise equipment that provides resistance and support for exercises involving every part of the body. 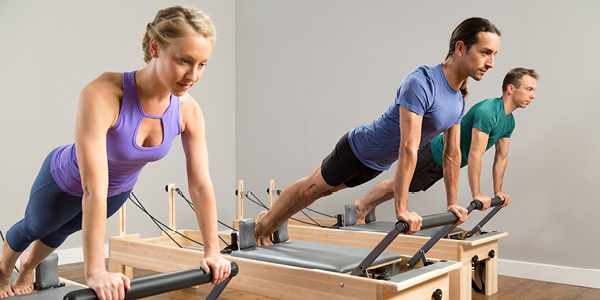 The Balanced Body® Reformer Instructor program gives you a thorough understanding of how the Pilates Reformer can develop core and extremity strength, stability, flexibility, coordination, and balance. The wide range of exercises provides a stimulating and fun workout for clients at any level of ability. The Balanced Body® Apparatus Instructor program includes the Mat and Reformer training, and completes the Pilates system with courses on the Trapeze Table (or Tower), Chair, and Barrels.